Millennial style wallet. REAL DARK BROWN ALLIGATOR SKIN credit card case. Interior is FINE brown calf leather. The exotic skin was professionally tan by us into leather. 4 credit card slots. Each case is unique. 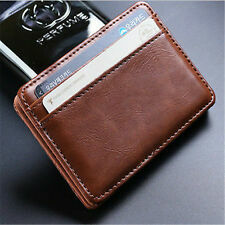 Structure:Be made of genuine leather,main section with 1 big main holder,can hold 23 credit cards ID holder,Simple fashion large capacity card bag! Item type: Card holder. Far from fire, pressure, and tinder.